Being the capital of Northern Ireland, it is no surprise to see Belfast as an extremely popular city and one that boasts a fantastic market for minibus hire. Airport Transfers – With Belfast regularly attracting tourists, every firm in the area attempts to take advantage of airport transfers. There are a huge range of companies offering this service and consumers will usually be able to find a very competitive quote. Intercity Hire – Due to the size of Belfast, there are some major companies that provide their vehicles between cities. For example, a customer could pick their minibus up in Belfast but then drop it off in another city in the country. Established in 1999, Belfast Bus Company has slowly emerged as one of the leading minibus hire firms in the city. The company currently hold twenty two vehicles, with the majority of these being wheelchair friendly minibuses that can hold up to fifty seven people. Belfast Bus Company offer their vehicles for a variety of different uses, with airport transfers, weddings and general client transfers being some of the most popular. The name of this company may suggest that they only handle car hire. However, this is not actually the case and King’s Car Hire also specialise in the minibus hire sector of the market. The main service that the company offer is airport transfers, although they are still available for a range of other uses with their prices being exceptionally competitive. Minibuses will cost a customer £75 a day or £420 for a week. 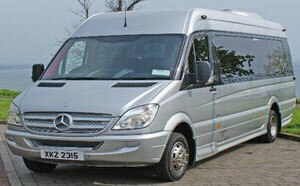 McComb’s Executive Travel have established themselves as one of the most prestigious minibus hire companies in Belfast. The company boast a highly regarded customer list, with the Irish Football Association and the Northern Ireland Tourist Board both being past clients. The firm has won numerous awards and offers customers five different minibus sizes, with the largest being able to hold fifty three people. Belfast has progressed immensely in recent years and this means that it is a common destination for short weekend breaks. This means that the tourism sector has become huge in Belfast, resulting in customers having a large number of minibus hire firms available to them. This has meant that prices have lowered and consumers have a real dilemma on their hands about choosing a reputable firm.